When Carnival Corp. CEO Arnold Donald reported to Wall Street recently, the 2019 outlook wasn't as strong as some had hoped it would be, and CCL stocks subsequently dropped. But there were clear positives in the report. One that truly stood out was Carnival Cruise Line's performance in the Caribbean. As one example, Donald pointed to strong bookings for Mardi Gras, the first of a new generation of ships for CCL, to be delivered in AUG 2020. 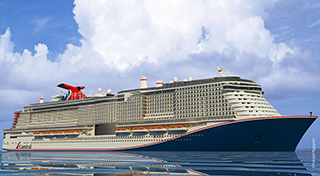 "Mardi Gras generated record bookings for a new ship launch by the Carnival brand, with almost 10 times the number of bookings as the very strong Carnival Vista launch back in 2016," he reported. "Overall, Carnival continues to outperform in the Caribbean, with bookings ahead in both occupancy and rates across all future quarters." Donald also indicated media coverage is strong: "For Carnival Cruise Line, the new roller coaster experience of Mardi Gras alone generated over 1 billion media impressions." It's an impressive number, although to put it in perspective, during the same call Donald said that Holland America captured over four billion media impressions around Oprah's Girls Get Away cruise and the naming ceremony for Nieuw Statendam with Oprah Winfrey as godmother. Carnival Senior VP of Sales and Trade Marketing Adolfo Perez provided further perspective on Mardi Gras, the first Excel-class ship. He pointed out that the last time Carnival Cruise Line launched a radically new class of ship was in 2001 for Spirit-class. Since then, he noted, new ships have been an evolution: "The ships have gotten bigger, wider, taller, more dense, more bells and whistles, more restaurants, more venues for people to enjoy onboard. But what I'm really excited about with the Mardi Gras is that she's a completely different ship class, and she will look nothing like our existing ships. The layout, even the crew area is completely different. The renderings are amazing. The rooms are going to be awesome. Mardi Gras is revolutionary."